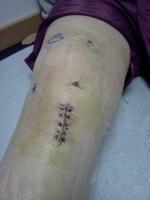 My daughter had patella re-alingment year and now has a screw in her leg right below the knee. She slipped on ice last week and heard a loud "pop". Her knee swelled, more so even a couple of days later. We went to the ortho and upon examination he said he was positive she tore her ACL, that her knee didn't catch like the other knee did and the other symptoms matched as well. He ordered an MRI. I got the MRI report back and it does not show a torn ACL. Could an MRI be wrong? ?